About a month ago, my wife and I drove from North Carolina to St. Augustine, Florida. Our route via I-95 took us through the town of Walterboro, South Carolina, where I decided to take a little detour. Why? So we could visit the Breland Cemetery, which is in the rural countryside several miles outside of Walterboro. It’s a small cemetery that contains about 45 graves and is surrounded by a chain link fence on a plot of ground located between a farmer’s field and the surrounding woods. One of the trees closest to the cemetery has what appears to be a deer hunter’s tree stand attached to it. My mother’s maiden name is Gloria Dell Breland, and I knew that she was descended from a man named John Robertson Breland, who was born in that part of South Carolina in 1794 but had settled in Louisiana before the War of 1812 began. I knew this thanks to a book, The Breland Families of the Southern States, 1755-1875, that was written by my mother’s older brother, Charles Gregory Breland. Uncle Greg self-published the book in manuscript form in 1987. After Uncle Greg died in 1994, my mother’s younger brother, Hunter M. Breland, arranged for a memorial edition, which he edited, to be published as a hard back. This is Breland Cemetery in Colleton County, South Carolina. 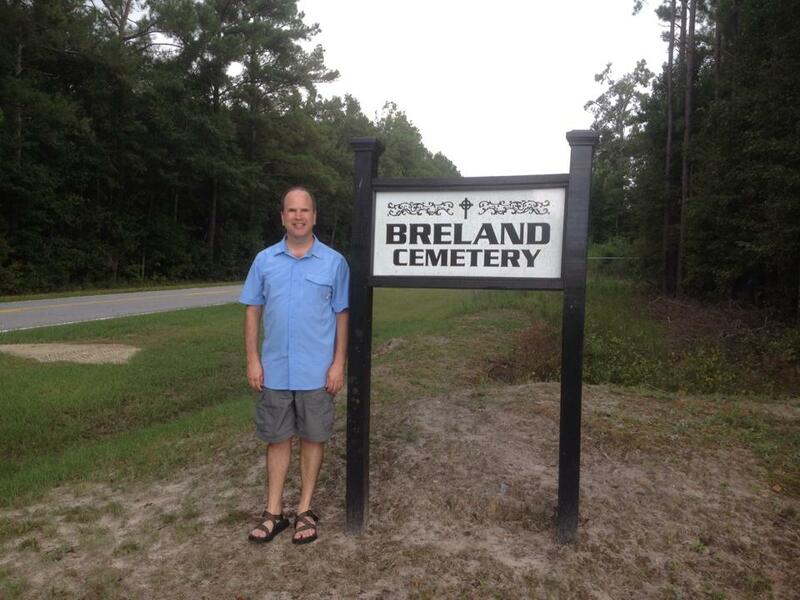 So I figured there was a good chance I was related to the Brelands who are buried at Breland Cemetery. Once we got back home from that trip, I started looking into it, and found that I was indeed related to everyone in that cemetery who was born with the Breland surname. I can’t say that for the wives of men named Breland who are buried there. If you trace John Robertson Breland back to his earliest confirmed Breland ancestor, you get to his grandfather, a man named Abraham Breland, whose surname was recorded at various times as Breler, Brelar, Breelo and Breland. Abraham was born about 1725 (some researchers say he was born in Pitt County, North Carolina; others say he was born in what later became Germany) and died about 1805 in Estill, South Carolina. 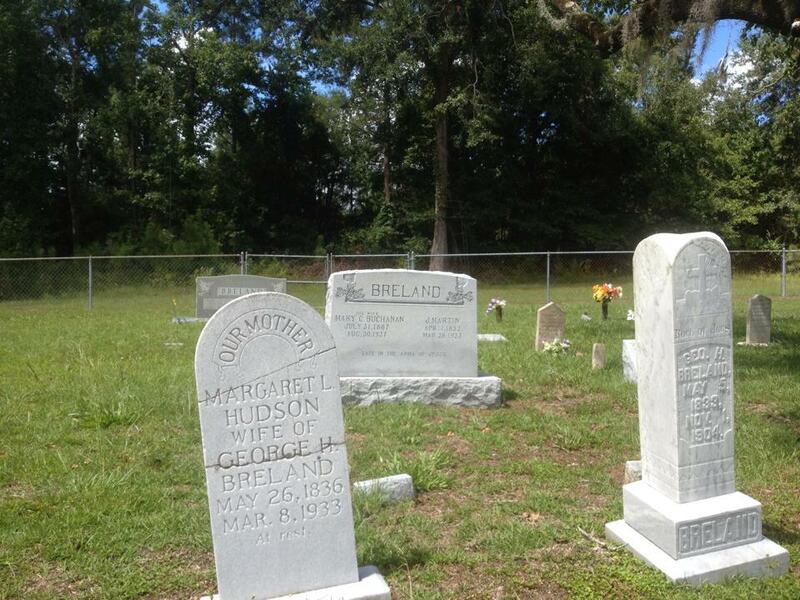 The Breland Cemetery outside Walterboro is about 33 miles from Estill. As I continued to research the Brelands buried in South Carolina, I learned that many of them trace their ancestry back to the same Abraham Breland as my mother. And, thanks to Uncle Greg’s book, I knew that many of the Breland families in Louisiana, Mississippi and Alabama are descended from Brelands who moved west from South Carolina in the early 1800s. There are only 2,663 people named Breland listed worldwide on the Find A Grave website. The overwhelming majority of these, more than 2,500, are in the Southeastern U.S. Based on this information, it seems plausible to me that I may actually be related to most if not all of the Brelands in the South. That is certainly not the case for the surname I inherited from my father, which is Hughes. There are more than 100,000 people named Hughes in the U.S. listed on Find A Grave, and I know from my involvement in the Hughes DNA Project that there are many people named Hughes that I am not related to. As a pilot test for my theory about the Brelands, I decided to research the Brelands who are buried at Mobile Memorial Gardens in my hometown, Mobile, Alabama. One of my mother’s brothers, Lyman Breland, is buried there. But there are several other Brelands buried there that my mother told me she had never heard of, including the Rev. Murphy B. Breland (1910-1997). After researching his Breland line, I came to the conclusion that he is my 4th cousin, twice removed. So, is your name Breland? Want to find out if we are related or not? If so, then I’d love to hear from you. Email me at tahughesnc@gmail.com. Is it possible to get a copy of the hardbound book. I live in La and have Breland grandparents. I would like to participate in this project. I am Leigh F. Breland’s (Gloria’s brother) granddaughter, Emily Catherine Breland Montalban. My Dad, (your first cousin) Is Alan L. Breland, Sr. If you have any trouble, feel free to email me at tahughesnc@gmail.com.